Community leader Lawanna Gelzer is turning up the heat on incumbent Orlando Commissioner Sam Ings ahead of the upcoming municipal election. Gelzer, who is challenging Ings in the District 6 race, slammed Ings for his excessive spending and raised questions about whether the longtime city commissioner uses public tax dollars for electioneering purposes. Gelzer has been very active going door-to-door to reach out to voters ahead of Orlando’s November 3rd election. 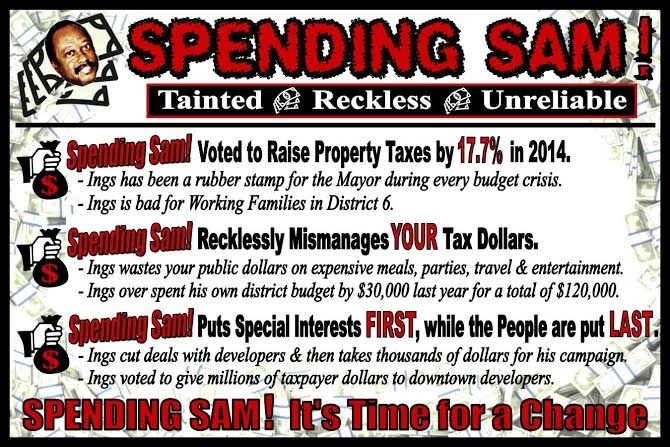 Last week, her campaign started delivering a hard-hitting mailer calling out the incumbent as “Spending Sam” (see the campaign literature below). Ings has been spotlighted in local news recently for exceeding his commissioner budget by nearly $30,000, spending almost $121,000 in just the last year. After an in-depth investigation launched by this site into Orlando City Commissioner spending, the spending by Commissioner Ings raises major red flags, including possible benefits to his re-election efforts. For example, Ings spent $10,000 on last year’s District 6 Annual Seniors Thanksgiving Concert. The price tag was high for a community event, but most of the costs went to entertainment. The largest chunk of taxpayer dollars went to CMJ Resources & Development Group, an organization owned by Cora Miles Jefferson. Ms. Jefferson was paid $4,900 for “management and entertainment artists” for Ings’ Thanksgiving concert. She was also paid another $1,545 for “advertising” by Commissioner Ings from his city account. It turns out, Ings spends a lot of money with CMJ Resources & Development, paying Ms. Jefferson another $1,000 in June 2015 and $2,300 during the 2014 summer. Ings also paid three other entertainers, including James Bolton ($1,500), Beverly Crawford ($3,000) and Robert Hatcher ($500) to perform at the Thanksgiving concert. In return, Cora Miles Jefferson endorsed Commissioner Ings for his re-election bid. Ings is using that endorsement on his official campaign literature, touting Jefferson’s support – is this part of the advertising Ings paid for using public tax dollars? 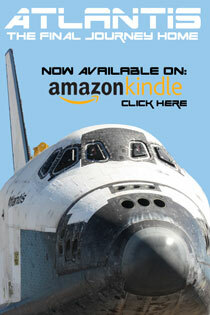 View Ings’ campaign literature here. Now if that is not an endorsement bought with public tax dollars, what is? Ings also contributed $2,500 to the Experience Christian Center last year, raising similar questions as to how residents feel about tax dollars being sent directly to a church. Among other notable expenses, Commissioner Ings spent a whopping $30,000 for food, office supplies and other materials since 2014. There are thousands of dollars in catering costs, including more than $3,000 paid to College Park Foods, which is not based in District 6, to cater two events in his district last year. Ings also pays for his cell phone and his aide’s phone costs, spending another $2,200. The District 6 Commissioner also enjoys expensive entertainment options. He charged around $10,000 for his own travel, parking and conference fees. None of the other Commissioners use taxpayer funds to cover travel, parking and hotel costs similar to Ings and District 5 Commissioner Regina Hill. At a recent candidate forum for District 6 presented by Orange County Black Voice and hosted by political organizer and community activist T.J. Legacy-Cole, Commissioner Ings was a no-show but his spending habits came under scrutiny from his opponents. In addition to Gelzer, Nathan Chambers, Marcus Robinson and Ka’Juel Washington are also running against Sam Ings this year. At the forum, voters could not receive any answers from their elected commissioner about how he is spending their tax dollars. “I will listen to the people and implement the needs of the community, not the special interest groups, not the big developers, but the community,” Gelzer said at the candidate forum. 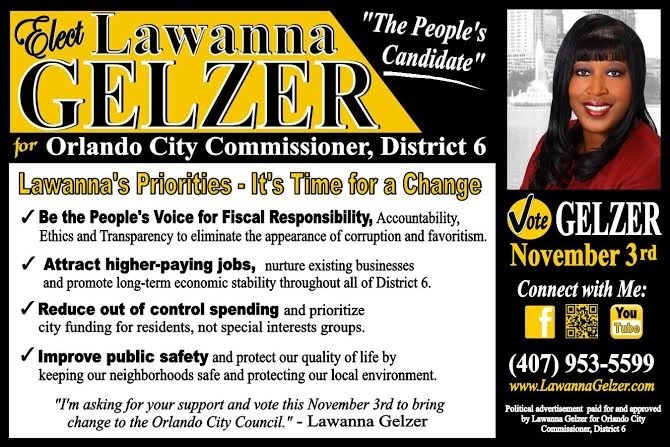 Gelzer’s campaign literature is creating buzz throughout the District 6 community. For Spending Sam Ings, there’s no escaping his own spending habits and voting record. You can review Commissioner Ings’ detailed spending and expenses since 2014 here. One Response to "Gelzer Slams Commissioner Ings’ Excessive Spending"
I am loving the platform against the 17.7% property tax increase that was passed by the mayor and every commissioner last year. They deserve to lose their comfortable seats for that little surprise. We, the people, plan to vote each one of them out including the mayor. We deserve accountability from each commissioner and the mayor.